We got to check out the brand new Daniel Patterson restaurant in Oakland tonight. Overall, a great experience! The space is brand new and really lovely. Swanky and rustic at the same time, with lots of stonework and wood. It gives an upscale yet relaxed vibe. The kitchen is an open kitchen, with bar seating all along it. We were seated at a table since we were a party of four, but I'd love to sit at the counter and watch the action sometime. 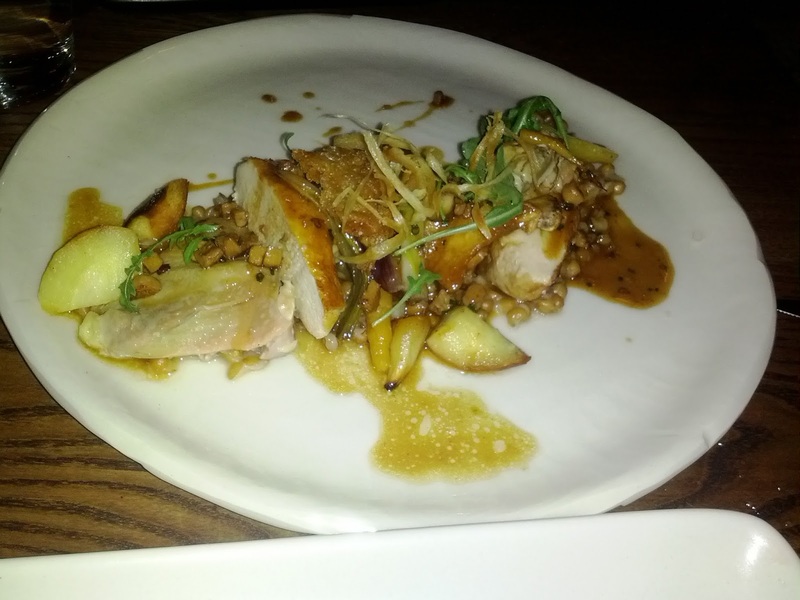 The food was slightly upscale versions of classic comfort food. All very well executed. Portions were large for this caliber of food and certainly for the price point. I'm not sure if the Oakland location is responsible for the pricing, but I was really quite shocked at the quality/price/portion sizes. For example, mains were ~$25; for the same quality they would be $35 at most places in SF and the portions would be significantly smaller. House made complimentary sparkling water as well. Like any Patterson establishment, the repeated standouts were the vegetables - even when they are just a side element on a plate, they shine! The service was good and they went above and beyond when there were some slight issues. The starters actually came very quickly (faster than most places), and then there was a short lull before our mains arrived. I wouldn't have thought anything of it, as it really wasn't any longer than most places, but the manager came over to tell us that there had been a problem in the kitchen and that our dishes would arrive soon. Then one of the serving spoons they gave us had a particle of food on it, which someone overheard us noticing and quickly replaced. And our brussels sprouts didn't arrive with the mains. Once we ordered dessert, the manager brought over glasses of dessert wine for all of us to make up for the issues. This was a nice gesture, and wasn't really expected, as these issues were all fairly minimal and we didn't complain about any of them. Then the biggest surprise came with the bill. They told us that due to the mishaps they had discounted a few things. I assumed that meant the brussels since they were mis-timed. But ... they comp'ed us all of the entrees, the sides, and the desserts (and the dessert wine they added). Seriously? This was completely unexpected and rather amazing. 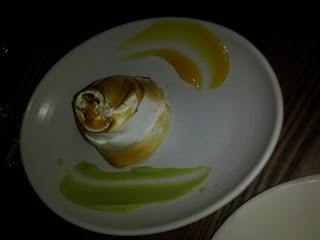 Top bites of the evening: caramelized brussels sprouts, seared scallop, seared fennel, merengue. Summary: I would gladly go back, and wish it were located in San Francisco and not Oakland. It wasn't the meal of a lifetime or anything like that, but it was all very good, I liked the atmosphere, and the prices (even when not discounted!) were very reasonable. I really wish this was in my neighborhood! 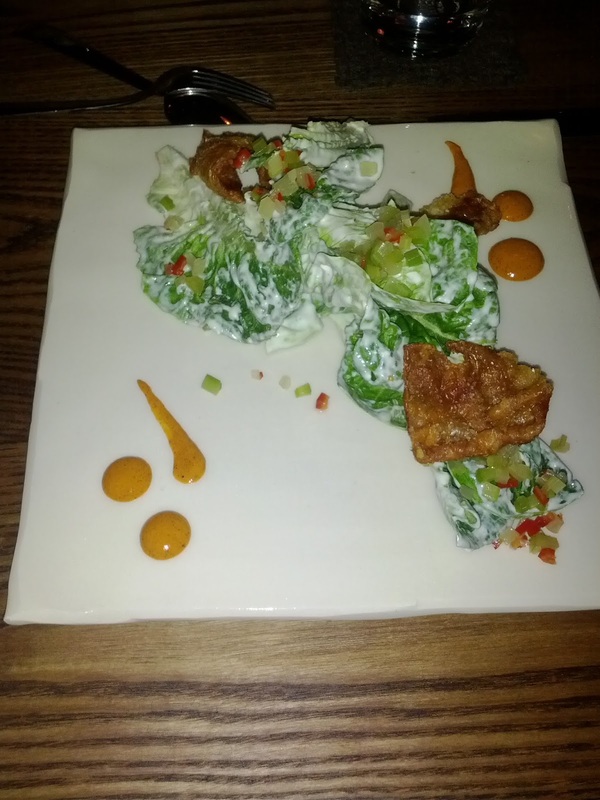 Little gem salad, with gorgonzola dressing, pickled celery and jalapeno, crisp chicken skin, hot sauce. $11. 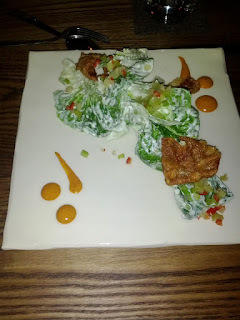 This was their play on a classic iceberg wedge salad crossed with buffalo chicken wings. From the iceberg wedge side of things, to class it up, instead of iceberg, they use little gems. Instead of ranch dressing, it was a blue cheese dressing. Which seques into the wings portion, with crispy chicken skin and hot sauce. This was a very well executed salad, but at the end of the day, still a salad. The little gems were fresh and crisp, and the perfect lettuce choice for the dish. 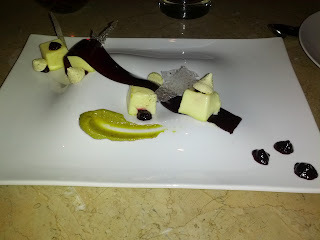 The pickled celery added a really delicious, creative touch, although it was easily lost in the dish if you didn't specifically pick out pieces to taste. The crispy chicken skin was incredible. I wouldn't have identified it as chicken skin without some hints, but it was tasty fried goodness. The hot sauce, the blue cheese, and the chicken skin did taste exactly like chicken wings. I wouldn't go out of my way for this dish again, but I'd gladly eat it. 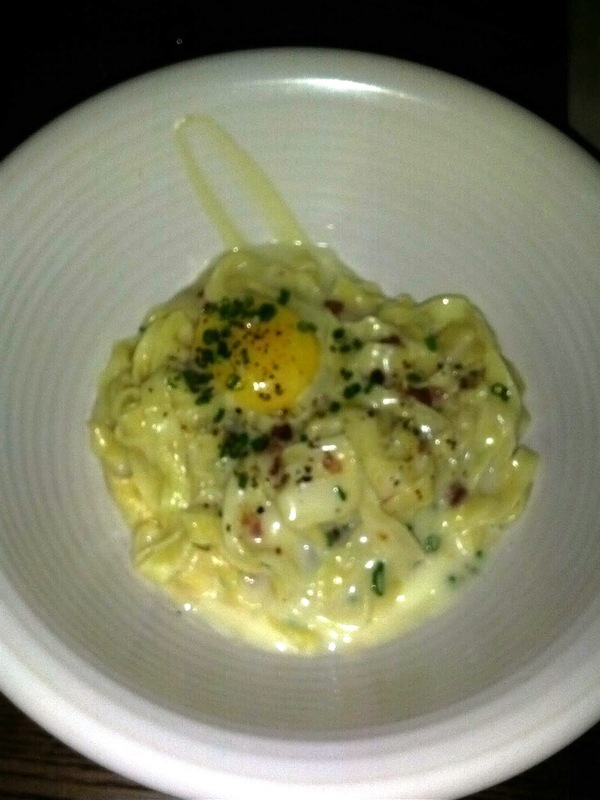 Smoked housemade fettucini, with onion soubise, pancetta, egg, chives. $13. Another play on a classic, this time on pasta carbonara. In this case, they smoke the flour that is used to make the pasta, imparting a deeply smokey flavor. The onion soubise was nice and creamy, and the pancetta added another nice flavor component. The pasta was clearly fresh and handmade, and was cooked perfectly. 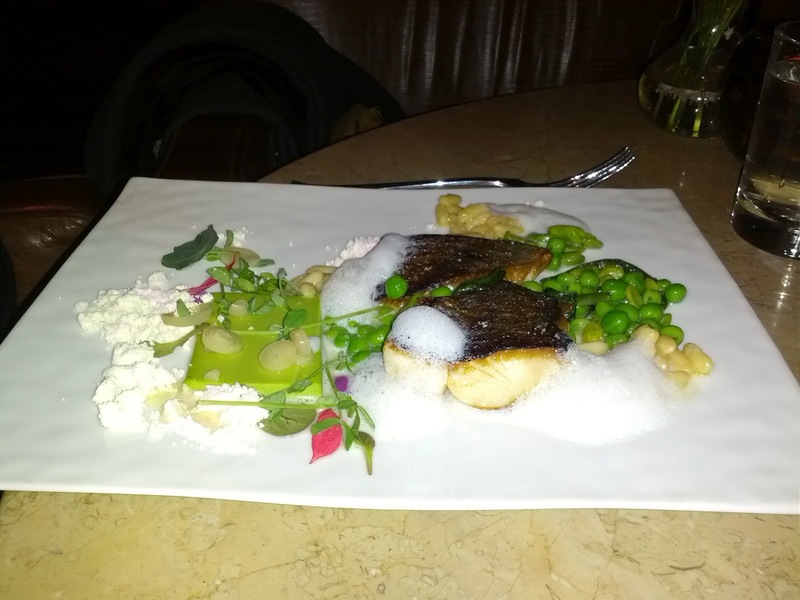 That all said, this dish didn't wow me, as my expectations were high due to all of the reviews I'd read raving about it. Don't get me wrong, it was good, and the smoked pasta was definitely interesting, but it didn't blow my mind. One side note - I later dipped bread in the leftover sauce, and found that the sauce flavor complimented the more plain flavor of the bread better than the smoked pasta. But I also really appreciated the smoked flavor in the pasta, just not with the sauce. This is a case where the sum of the parts just wasn't actually better than the individual components. I'd like to see what other directions they go with the pasta in the future. 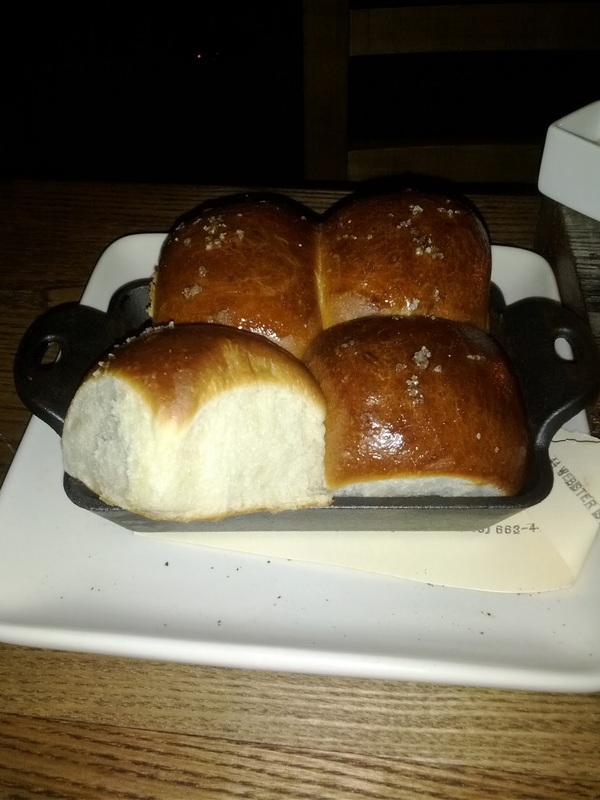 Parker House rolls, topped with sea salt. 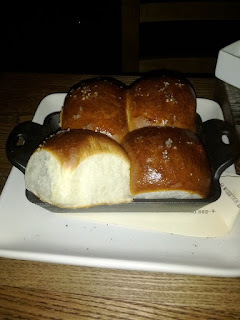 Parker House style rolls. Served fresh out of the oven, nice and warm, soft, slightly sweet, with crisp exterior with a touch of salt. A good roll. 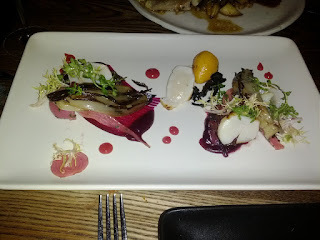 Dayboat scallops, with heirloom beets, frisee, seared fennel, black trumpet mushrooms, blood orange, endive. The scallops were nicely seared and tender, with simple if any spicing on them. I was surprised by how flavorful they were for being so plain. Very well executed. The heirloom beets, mushrooms, assorted greens, and blood orange sauce didn't really do much for me, but they certainly didn't detract. Chicken (breast, wing, thigh), cooked sous vide, then stuffed with foie gras, then seared in a pan, with wheatberries, root vegetables, in a foie gras and banyuls sauce. I don't normally order chicken at restaurants, but I'd read many good reviews about this dish. The chicken was very moist and tender. I guess it was a nicely prepared chicken, but it was just ... chicken. The wheatberries and the foie/banyuls sauce made for some pretty tasty bites, bursting with flavor and richness. But the standout on this plate for me was the root veggies, cooked perfectly (not too soft, not too raw) combined with the sauce. Surprisingly delicious. Crispy, caramelized brussels sprouts with mint, lime, and garlic. $7. ZOMG. Winning dish of the night. Any person who doesn't like brussels sprouts would have their mind changed by this dish. 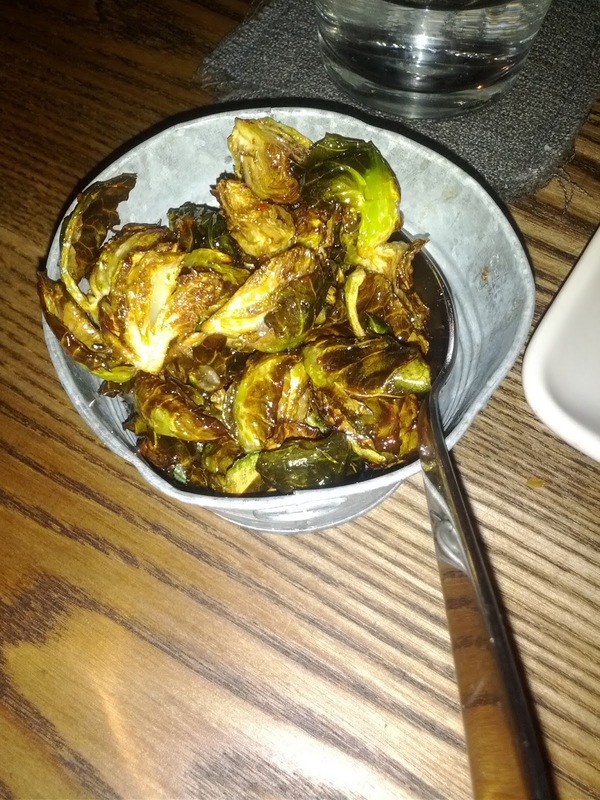 Then again, anyone who loves brussels sprouts would probably be upset at this dish. Let me explain. As you can probably tell from the picture, the sprouts are very crispy and caramelized. The leaves that had separated were like fried chips. And the flavors ... wow! People use the phrase "explosion in my mouth" and I usually roll my eyes at it, but this is a case where it really applies. So. Flavorful. But, you don't really taste the brussels themselves much at all. Can I have more of these ASAP? "Baked California", fennel merginue filled with vanilla ice cream and orange sorbet, on top of a lemon cookie crust, and served with kiwi and citrus sauces. $10. Their play on Baked Alaska. The merengue on top was insanely fluffy and flavorful. I've never had merengue this good in my life before. Usually merengue is just sorta there as a topping; for me this stole the show. I could kinda care less about the rest of the dessert, I just wanted more and more merengue. 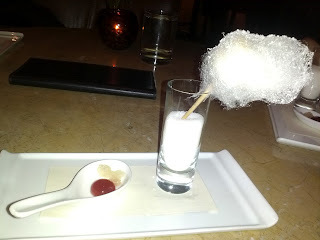 I have no idea how they got it so fluffy and delicious! Inside was vanilla ice cream and orange sorbet, which were nice enough flavors combined together, sorta like a classic creamsicle. The cookie base it was on added a textural component to the dish but wasn't really necessary. Can I please have more merengue? Lime tart, with sesame brittle. $10. 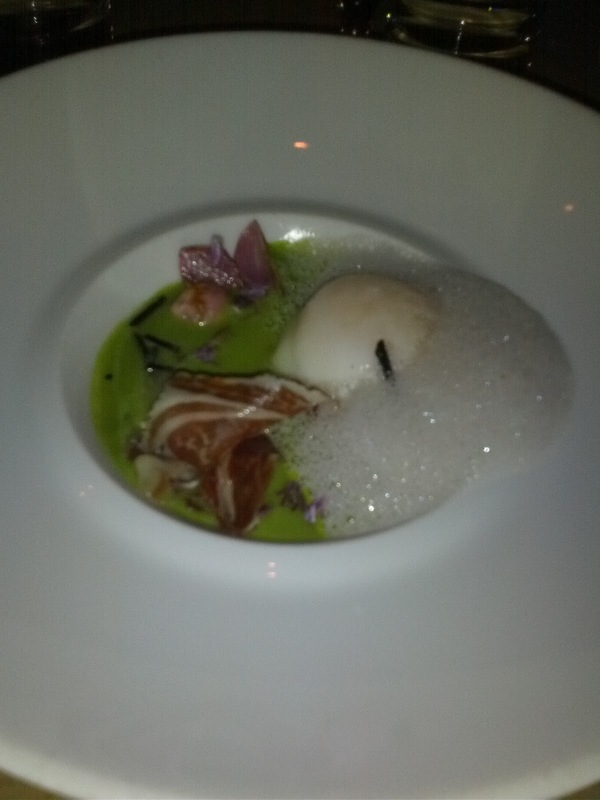 My least favorite dish of the night, but not one I'd normally order, so this is likely just personal preference. Slightly tart lime filling, on top of a crust, with some sesame brittle stuff. Not bad, but particularly noteworthy. Tonight's culinary adventures were pretty radically different from the dining I've been doing lately. No Michelin stars were involved, yet amusingly, a dress code was. In a big change of pace, we headed to Lucky Strike, a swanky new bowling alley in SOMA. The space used to be a Borders, and is now filled with a very large bar and lounge area, tons of flat screen TVs, and of course, the bowling alley (10 lanes?). It is all very modern, sleek, and basically exactly what you'd expect from a brand new, expensive, bowling alley in that part of town. Service wasn't great. I ordered a cocktail, and it took ... 45 minutes. Yes, 45 minutes. The server came by several times and did ask if it had arrived yet, so he was being attentive, but seriously, WTF? He did remove it from the bill as well. Someone else asked for water, and it never came. Nor did the napkins or plates we asked for. Our mac and cheese arrived without silverware (I think this is the only menu item that would normally use silverware, so I guess they aren't too used to people needing it?) I wasn't really expecting great service in a bowling alley, so this pretty much matched expectations. Clearly, most people go there for the bar. Or to bowl. They don't go for the food. But ... food is what I am all about, and thus, I was there to seriously evaluate it. We ordered a variety of items off of the menu, which tried to be fairly high end bar food: sliders, tacos, sushi, fries, fondue, wings, deviled eggs, mac & cheese, nachos. 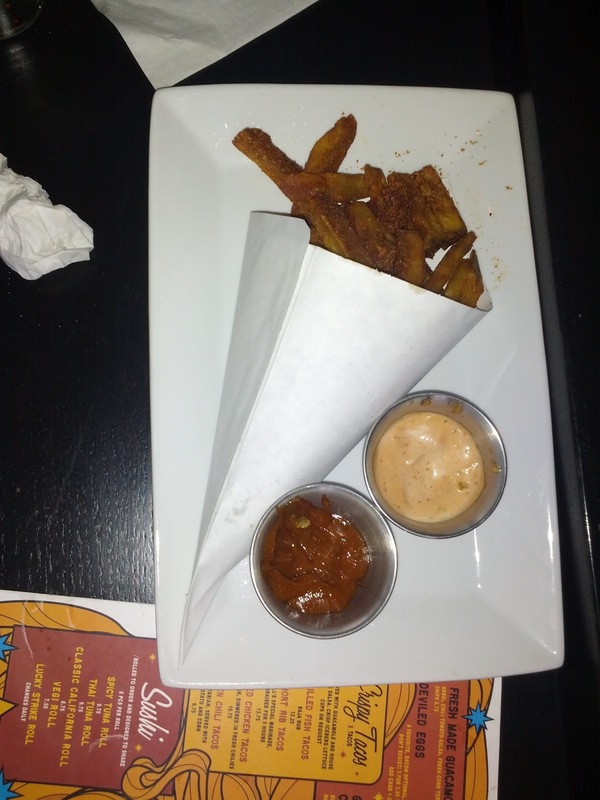 Most of it was pretty awful, with the only decent thing being the fries and dipping sauces. Full reviews below. One other thing ... eating finger foods and bowling at the same time is really gross. Everything, except the mac and cheese, was finger foods, and it felt really wrong to eating with the same hands that were using the public bowling balls. Speaking of the bowling facilities. They were nice. Plentiful balls, no equipment failures, modern software. Fairly large space for food/drinks in-between each lane, and a big back counter as well. My only real complaint about the space is that it was too narrow. It was really hard to get to the lane from the seating area if others were seated, we were constantly needing to ask each other to move. Homemade Belgian Fries. Curry Ketchup, Spicy Russian & Chimichuri Aioli. $5.75. These were really quite good. Thick fries, with a rather addicting sweet + spicy rub on them. Some skin on. There were a mix of Idaho and Kinnebek potatoes, all supposedly "hand cut" and twice fried. The exteriors were crisp, the insides soft and fluffy. I really enjoyed the spices on them as well. But we all know how much I love sauces, and these were no exception! Each order comes with your choice of two sauces. For the first order, we had the curry ketchup and the spicy russian and chimichuri aioli. The second time around, we got the chipotle mayo. I usually don't care for curry ketchup, but this was really well balanced with a nice curry flavor. The chipotle mayo had a slight kick and was addicting in the way that mayo is. The spicy Russian and chimichuri aioli was very similar. I genuinely liked the fries and thought they were good, with or without the sauces. Not that I've had a lot of fries, but these were probably the best I've had in recent memory. A kinda small portion for the price though. Fresh guacamole, arbol chili tomato salsa, and fresh corn tortilla chips. $5.75. Tortilla chips were very thin style, crispy, but completely flavorless. Definitely needed some salt or something. The salsa was pretty blended, without any substantial chunks, and had a little bit of kick to it, and some smokiness. People said it reminded them of Papalote. 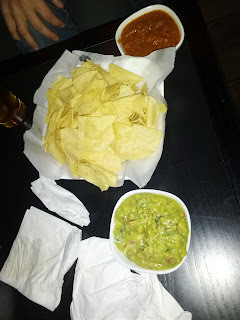 The guacamole seemed fresh enough, had some little chunks of avocado and tomato, but wasn't particularly noteworthy. This was all very generic. I've had much better chips, salsa, and guac at other places. Not really worth ordering. These were beyond generic. No flavor in the filling whatsoever. I don't know how they managed to create something so bland. You didn't taste the yolk, you didn't taste mayo, you didn't taste spices. Just ... nothing. They normally come with bacon, but we had vegetarians in the group, so we got them without. You can also add crab on top for $1 more. Perhaps they would have been good with those items in addition? They were also completely sloppy looking. Mac n' cheese, brown rice pasta, gluten free. $10.75. More generic bland food. Decent creaminess to the sauce, but it wasn't very cheesy, and needed some salt. The pasta was nicely cooked however. It is strange that they choose to make their mac and cheese with brown rice pasta as the only option, given how pretty much everything else on the menu contained gluten, it isn't like they were trying to avoid it in general. That said, I wouldn't have known it was GF pasta unless I'd read the menu. As we had no silverware, we had to eat this using the tortilla chips. Certainly not worth the price. Grilled Chicken Wings, celery, Maytag blue cheese. $9.75. The menu said "buffalo style" but these were covered in bbq sauce. I don't really like wings, so I didn't have one, but no one in our group finished these, so I'm guessing they weren't very good. It is also totally disgusting to eat these with bowling hands. The celery seemed fresh enough, but the blue cheese dip was yet again, flavorless. I would have guessed it was ranch, not blue cheese, as the blue cheese flavor really didn't come through at all, it was just creamy. Given how good the dipping sauces for the fries were, this surprised me. Grilled fish crispy tacos, baja rub. Served with salsa and guacamole. $12.25. Crispy tacos? Not really. The shells were too greasy to be crisp, they were more soggy than anything else. Way, way too oily. Inside the shells was mostly shredded iceberg lettuce. Thank you Lucky Strike, for reminding me that iceberg lettuce exists. I honestly haven't encountered it in several years. On top of the iceberg lettuce was tons of some sort of mayo sauce. The menu didn't say anywhere that it was going to come with this sauce, so I have no idea what it was. It had no flavor whatsoever. On top of that, was the fish. The fish was pretty dried out, and again, pretty flavorless. I saw the baja rub, but sure didn't taste it. The salsa and guac were the same forgettable versions as we got with the chips earlier. These were overall just really horrible. Greasy, mostly just iceberg lettuce, drenched in mayo, and fairly skimpy portion of fish. Skip, skip, skip. Short rib crispy tacos, Bill's special marinade, braised for 5 hours. $13.75. After eating the horrible fish tacos, I wasn't exactly inspired to try these. 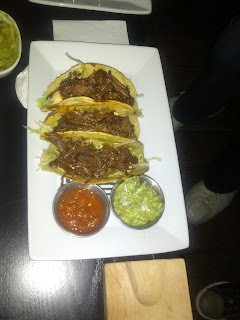 They were the only type of taco the group finished, so perhaps they were better? Grilled chicken crispy tacos, simmered in fresh chilies. $10.75. 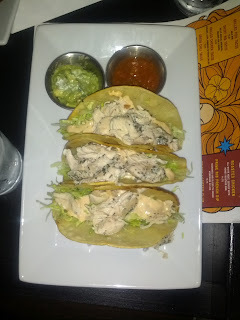 These were basically the same as the fish tacos. Ridiculously greasy shell. Iceberg lettuce. TONS of the mayo sauce. At least with these, there was a reasonable amount of chicken. The chicken was mostly white meat, pretty moist, and not all that bad. I didn't pick up the chili taste, but overall, not bad meat. But the rest of the components were just as bad as in the fish tacos. Dreamsicle: Vanilla vodka, Grand Marnier, orange juice, and Strauss organic soft serve. $12. The cocktail menu had a number of amazing sounding drinks. And a handful of them contained soft serve ice cream! How can you resist a drink with soft serve ice cream? 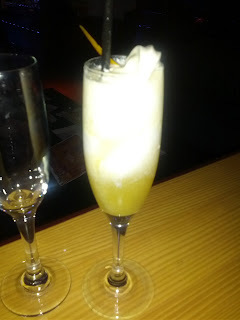 This sounded like it would be like a creamsicle - creamy, orangey, and delicious. It also sounded like it would take me back to my college days, where I had my share of screwdrivers. I waited 45 minutes for this thing of wonder to arrive! I was so excited! But ... it wasn't very good. It was kinda just bitter. It seemed like the ratios were off in the juice and alcohol. And it really wasn't very orangey. The vanilla soft serve however, was delicious. They have soft serve on the dessert menu, which you can top with chocolate, raspberry, or salted caramel sauce. If I were to ever return, I'd just get the soft serve. Another local, organic ice cream maker. And again, I fail to be really impressed with most the flavors or the consistency, but they are really friendly folks! Chocolate Peanut Butter: Smooth, chocolate and peanut butter flavors are mixed into the base itself. I tasted mostly chocolate, and not much peanut butter. Really would have loved a peanut butter swirl or chunks. Dad's Cardamon: Good cardamon flavor, if you want that sort of thing. Milk and Honey: Just sweet. Mocha Difference (coffee with flecks of dark chocolate): Chocolate flecks were nice but nothing all that special here. Peanut Butter: Good strong peanut butter flavor, ok creaminess. 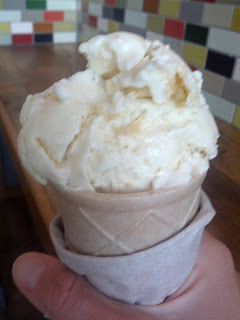 Salted Caramel: Sweet, slightly salty, good caramel flavor, creamy. I think it overtook Lemon Cookie as my favorite, although I still like the texture in Lemon Cookie more. Strawberry: Just basic strawberry ice cream, not remarkable. Vanilla Bean Ice Cream Sandwich. Chocolate chip cookies with vanilla bean ice cream inside. Sounds simple. Sounds classic. But this was amazing. 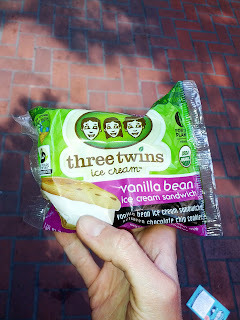 Perhaps the best ice cream sandwich I've ever had in my entire life. It tasted insanely fresh, even though it was pre-packaged and made who knows when. The cookies were soft, buttery, totally delicious. The cookies themselves were better than most cookies I've had in my life. Fantastic. And the ice cream was a creamy vanilla bean. Overall, this was super tasty. Seriously, best ice cream sandwich I've ever had. No others are even in the same league, certainly not the classic Nestle Toll House version, but also not even the made to order ones at Umami Burger with Humphrey Slocombe ice cream, or even the ones at the darling State Bird Provisions. The Metreon is being revamped, and with the renovations are a slew of new food vendors. I was very excited to see a new ice cream shop - Cako Creamery. They are the same company as Cako Cupcakes, and you can see the influence. Most of the ice cream flavors are a base ice cream with some flavor of cake mixed in. Unfortunately, I haven't really liked any of the ice creams. The consistency has been really hard, too frozen. I tried each flavor on multiple occasions, different tastings listing in brackets. 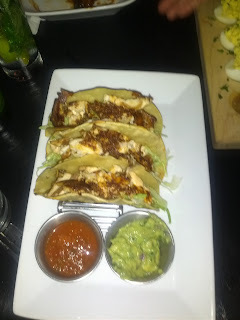 Tonight for dinner we checked out a fairly new seafood restaurant in the Mission, Lot 7. They've only been open a few weeks, but I've had my eye on them since I first read about it. There are plenty of restaurants featuring seafood in the city, so why care about another one? The big appeal for me was that they are on the more casual end of the dining spectrum, while still offering high quality seafood. I enjoy fine dining obviously, and I'm willing to pay for quality ingredients, but sometimes, particularly on a Sunday night, I just want to be able to get some excellent food, at reasonable prices, not need to dress up, and be totally comfortable. From what I read, Lot 7 sounded like the perfect place to meet these desires. I wanted to give them a few weeks to shake out initial issues, and it had been a few weeks, so, tonight was the night! As I said, Lot 7 is primarily a seafood restaurant. There were a few salads, a mushroom pasta, a steak, and a lamb special on the menu, but besides that, it was all seafood. The menu is fairly small, with a raw bar, some cooked starters, a few fish entrees, a couple sides, and a few desserts. Since there were only two of us we had to settle on trying just a few things, but I really wanted to try more, as even though the menu was small, it all sounded really appealing. In particular, I resisted ordering the crab mac and cheese. This sounds perfect to me, but also sounds like the ultimate disappointment dish. I love crab. I love mac and cheese. But both of these items are so often fail to impress me. I didn't want to risk it. 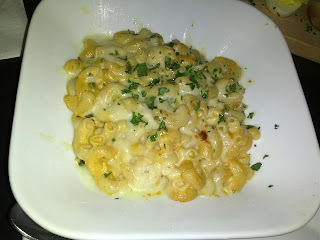 That said, after we ordered, I saw the owner sitting at the bar eating ... the crab mac and cheese! If it is his pick, perhaps it really would be good! (Although, he had a bottle of siracha with him too ... ). And every single one of the four desserts sounded particularly amazing, exactly the sort of desserts I adore (warm pear crisp & ice cream! Warm apple raisin bread pudding with butterscotch and salted nuts! Chocolate mousse with candied nuts, kumquat, malted whip cream! And my recent addiction, crème brûlée! ZOMG!). The food was all very good, except for the dessert, which was a bit of a disaster. See below for my full food reviews. The space is casual, open, inviting. A mix of seating arrangements: bar seating, a few chef's counter seats overlooking the open kitchen, a long communal table, and then some individual tables. We arrived fairly early (before 7), and it was pretty empty, so we were able to walk right in and get a corner table. By the time we left, it was full. Surprisingly, even though it was full, and the space all open, it somehow didn't get loud at all. Well designed! I love the open kitchen. I'm a sucker for this sort of thing as I enjoy watching chefs work. There were only two chefs in the kitchen, and they were busy, particularly by the time we left when the restaurant was full. They worked methodologically and calmly, executing and plating each dish to perfection. Service was fine and matched the casual feel of the restaurant. Our server seemed pretty busy near the end of the night, but was friendly and attentive enough. He was happy to recommend dishes when I asked what he liked. One interesting note is that he only told us about one special of the evening (the entree), but the other server told the table next to us about other specials as well. Hmm. Overall, I was quite happy with my meal at Lot 7, and it did meet exactly the need I was trying to fill: quality seafood, well prepared, moderate prices, casual setting. If you are looking for those things, I highly recommend. I'll definitely be back, and really wish it were in my neighborhood. If I'm in a small party again, I'd like to sit at the chef's counter to get a better view of the action. And I definitely want to try the crab mac and cheese. And give them another shot at dessert. 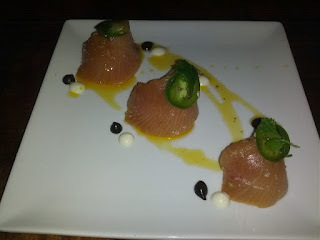 Crudo: Yellowtail hamachi, black garlic, meyer lemon, avocado, chili oil. $12. When this plate arrived, I was instantly impressed. I'm used to really nice plating, dots of different sauces, etc, but I wasn't expecting it here, at this price point. What a pleasant surprise! This was a dish that the waiter recommended, and is one that I'd read about as being a standout. Three slices of hamachi, each perched atop a mound of avocado, and topped with a thin slice of jalapeno. 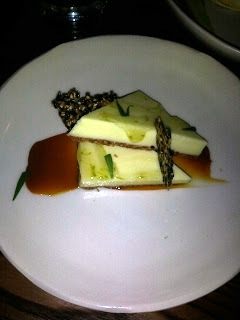 Chili oil, black garlic, and another sauce (the white one ... not sure what it was, perhaps that was the lemon?) dotted the plate. This was a light, refreshing way to start our meal (the rest of what we ordered was probably the heaviest stuff on the menu, oops!) The hamachi was a good cut, with a soft yet firm texture, good mouthfeel, and decent flavor. A lot better quality than pieces I've gotten at sushi places lately. The jalapeno gave a delightful little kick to it. The avocado underneath paired perfectly, and was really creamy and delicious. Unfortunately, I'm allergic to avocado, so I could only try one tiny bite that included it, but that bite was glorious (obviously, my allergy isn't that severe, but is bad enough that I reacted from just one bite, and shouldn't have any more than that, sigh). The sauces didn't really seem necessary, but I did dunk random bites into them to try them out. What really made this dish for me though was ... the salt! The salt level on this was just perfect. It really helped draw out the flavors. Overall, a good dish. I wouldn't go out of my way for it, but if you are in the mood for some crudo, this was a nice preparation, and definitely a good value at $12. Dungeness crab cake, delta asparagus three ways, soubise sauce. $13. I love crab. That is, I love GOOD crab, and I've really not been finding it lately. I guess the season is just over. I'm so sick of bland, tasteless crab. It should be fresh! It should be sweet! Sigh. I've pretty much stopped ordering it. This one intrigued me though. Crab cake, with asparagus three ways. That sounded ... springlike. Fresh. Promising. Two ingredients I love. Perhaps, just maybe, the aspragus pairing was a sign that it wasn't going to just be a pile of fried, tasteless crab. And ... of course I wanted to know, what were the three preparations of the asparagus! 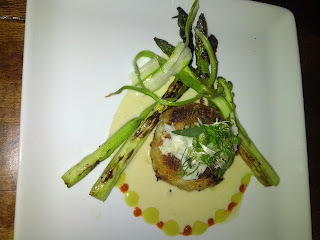 Even without the crab cake, I would have been tempted to order this, as I've been really enjoying the asparagus season. My first introduction to crab was in the form of a crab cake. Crab cakes still have a bit of a special place in my heart. Generic, yes. Fried, yes. Highlighting the crab, allowing it to shine and be appreciated? Uh, no. Honestly, you can usually throw just about anything in there, and the friedness, the fillers, and the sauces usually mask it all. Yet ... as I said, crab cakes still have a special place in my heart, so I tend to order them when I see them, although I know I won't be getting the dish to really appreciate the crab itself. I took my chances and ... was so very pleasantly surprised. This dish was awesome. First, there was the crab cake. It had all of the regular components of a crab cake: crab, some veggies (celery, onion? ), with some binding agent (eggs, bread? ), but it somehow was much more ... cakey than usual. I don't really know how to describe it. Cakey isn't quite the right way, it wasn't like dessert cake and floury or anything, but more bready perhaps? I'm not sure. I guess I mean it was fluffy? Anyway, it was moist and flavorful and I really enjoyed the filling. The outside was crisp and perfect, not too oily. I'm pretty sure it was pan seared rather than deep fried. 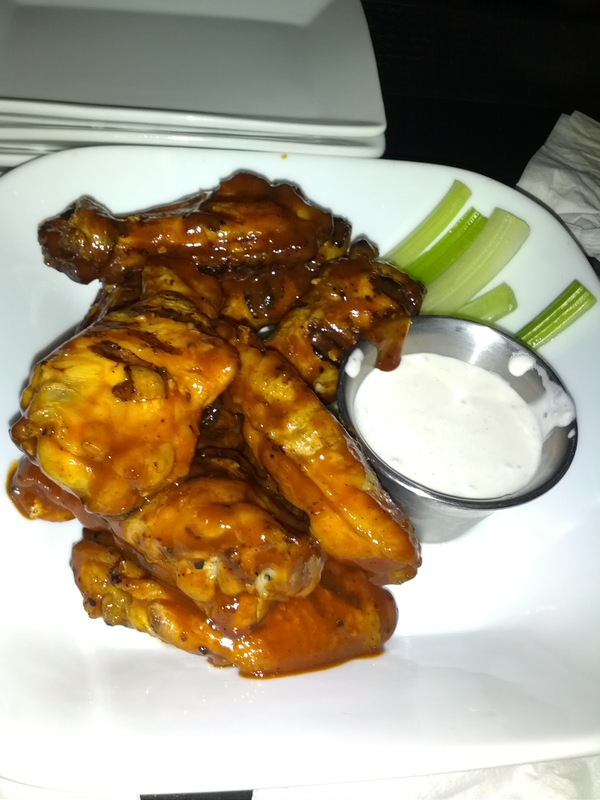 Great flavors, and perfect texture on both the crispy exterior and the soft interior. Just really, really well executed. Next, there was fresh crab meat on top. Fresh crab! Woah, you mean I get to actually taste crab with my crab cake? It was fresh, sweet, and some of the more flavorful crab I've had in recent memory. And then, the three ways of asparagus: grilled, fresh shaved, and (I'm guessing) in the sauce. The grilled pieces were nice thin, tender stalks. The shaved pieces were very fresh and crunchy. I didn't really taste any asparagus in the sauce, but I'm guessing that was the third prep? I'm not really sure. The soubise sauce paired really well with the cake, but I didn't think it went very well with fresh crab nor the fresh asparagus, as it was rich and kinda just coated these fresh components. 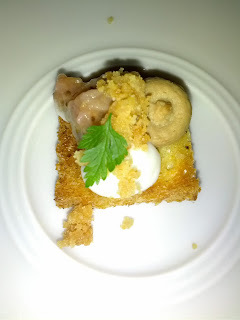 What I really, really loved about this dish was the different preparations. You got to experience both the crab and the asparagus in their fresh, pure forms and then in a more prepared form. This allowed me to appreciate the ingredients, to really taste them and understand them, but then also have them in the comforting formats as well. And even better, the fresh crab and the shaved asparagus paired together perfectly. The crab cake and the grilled asparagus also paired nicely. So many good things going on here! The one thing I do wish however was that the dish be plated differently. I'm all about that "perfect bite" and there was a lot to choose from here, some of which really didn't work. I found some real bliss in this dish by starting with fresh crab and the shaved asparagus and then moving on to the grilled asparagus and crab cake. I think a presentation that separated out the preparations would be more successful, and plating it more as a progression would help the diner appreciate it more. Anyway, I loved this. Perhaps the best crab cake I've ever had, AND a great preparation that allowed me to enjoy the fresh crab as well. And asparagus. And a really, really generous amount of crab for the price. Would order again and would return just for this dish. Batter fried rock cod and chips, gribiche sauce. $14. 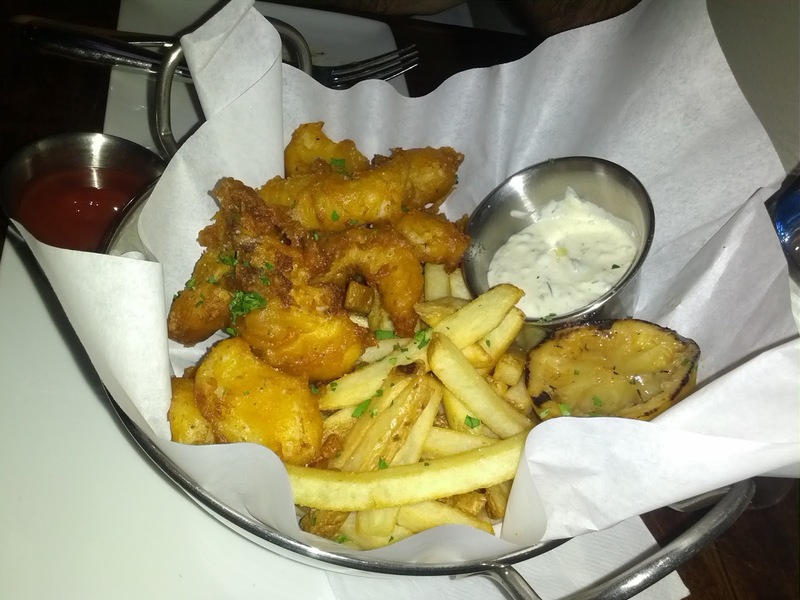 Coming down off my high from the crab cakes, I moved on to the fish and chips. Not something I normally order, but I'd read about this being a particularly good preparation. Fish, chips, grilled lemon, ketchup, gribiche sauce. The chips were mediocre-poor. Skinny fries, salty, some skin on. Some of them were actually a little soggy, none were super crisp. The ketchup was also just totally generic. This aspect of the dish was pretty weak. But the fish was awesome. Moist, flaky, white fish. Just the right amount of breading, it didn't overpower the fish, but it was substantial enough to really have something to bite into. Perfectly crispy exterior. Not too oily, although obviously deep fried. Served very fresh out of the fryer, delivered piping hot. The pieces of fish were also smaller than I'm used to, but this form factor worked well, making it more finger food and appetizer-like (it was actually on the menu as an appetizer, but we ordered it as a main). The lemon was weird. It was grilled, so it was a little strange to pick up and squeeze over the fish. I'd have preferred to just have a fresh lemon to use. The gribiche sauce was mediocre. I'm a sucker for mayonaise, and I usually get addicted to mayonaise based sauces. This just didn't have a whole lot going on. I still dunked most of my fish in it, as I kept wanting to like it more than I did. In retrospect, I would have either preferred a better dipping sauce, or none at all. It wasn't really necessary, as the fish was really quite fantastic on its own, particularly with some of the lemon squeezed over it. I'd order this again if I was in the mood for fried fish, because the fish itself was so good, but I'd like to see the other components improved more, as they were disappointing. Side note: apparently at Happy Hour this dish is half price, only $7. Seriously? That seems insane. Even at $14 it seemed like a good deal. Madagascar vanilla crème brûlée, muscato marinated strawberries, candied pecans. $8. And ... the big disappointment of the evening. A seriously failed crème brûlée. If you've been reading my blog, you know that I am a dessert-o-holic. In particular, I'm crazy about custard based desserts these days, and for crème brûlée. All of the desserts sounded amazing, but since my dining companion had already declared that he wasn't having any dessert, I had to order just one, and clearly, it had to be the crème brûlée. I was so excited. I asked the server how intensely vanilla flavored it was, since I love a really classic strong vanilla crème brûlée. He said it was really strong since it was Madagascar vanilla. And topped with strawberries? Yes! Another great ingredient, just starting to come into season, and delicious. Seriously, hurray for spring! I saw that the next dessert on the menu came with candied pecans. I love pecans. I asked if it was possible to have a few of those thrown in on top as well. Yes! It arrived, with the top looking a little bit on the thin and weak side. Where was my lovely brûlée layer of crisp, caramelized goodness? I went to tap on the layer to test it out, and ... my spoon went right through. There wasn't a hint of resistance. What??? 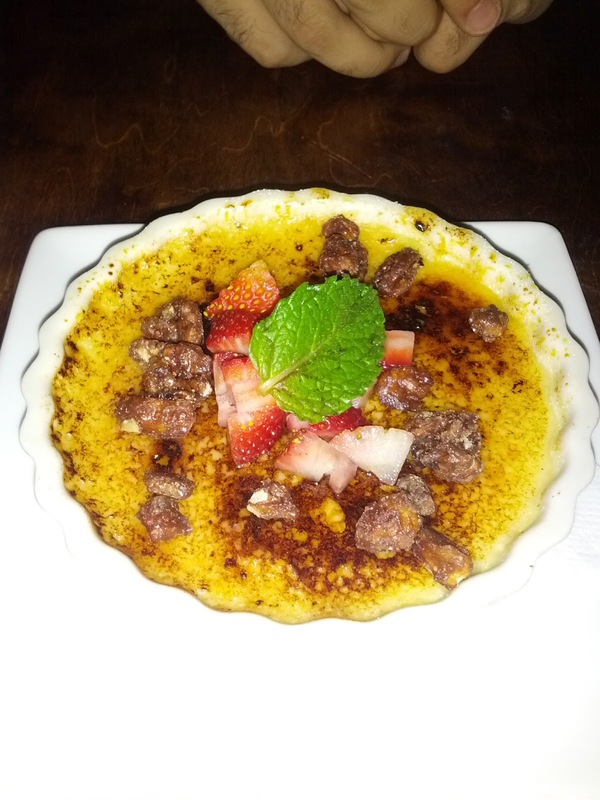 The most fun part of crème brûlée is breaking through that shell! There was absolutely no shell here whatsoever. None. The top was soggy. SOGGY. My guess is that it was brûléed far in advance, and was sitting, covered, in the fridge in the meantime, rather than done to order, and what once was a shell just turned into sogginess from condensation. Or something. I'm not sure. Even worse, this part tasted bad. More burnt than caramely. The candied pecans also tasted burnt. They weren't meant to go with this dessert though, so I'm not upset by this. I just removed them. I guess I just expected "candied" to imply that they'd be sweet, but these were really bitter. Perhaps they paired well with the chocolate mousse they were meant to go with. The strawberries seemed like just fresh strawberries. Perhaps with a little sweetener added, but I didn't really get the muscat marinade at all. They were decent, although some where a little white and under-ripe. It is early in strawberry season though, and I was just happy to see them making an appearance. And now for the most important part, the custard. The sweetness level was good, but it wasn't very vanillay. It definitely had some vanilla flavor, but I'd have liked it even more intense. But the real issue was the consistency. 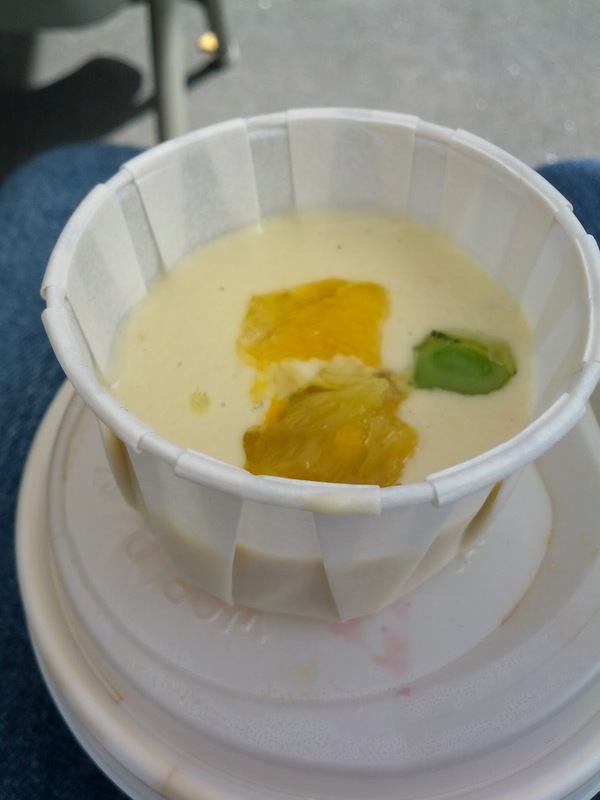 It was fairly liquid, more of a smooth, runny pudding than a custard. I commented on this, and my dining companion, who had a single bite from the other side of the dish, looked at me in surprise, saying that he thought it was lumpy and too solid. What? 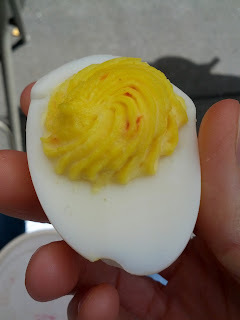 I went and took a bite from the other side of the dish, and sure enough, that side was nothing like my side. It was more like a quiche or something, full of chunks, and really eggy. What on earth happened here? We basically had one half of a runny, mediocre pudding, one half of a eggy chunky quiche, with a soggy burnt layer on top? This was one of the worst executions of crème brûlée I've ever had. I normally would have said something at this point, because this was truly terrible, but my dining companion wasn't feeling well (and hadn't been the entire time, and really didn't want me to order dessert, but I kinda insisted), and he really, really wanted to leave. So we didn't say anything. I can only hope that something just went horribly wrong tonight (water got into it perhaps? egg was too hot at some point and scrambled? I dunno ... ) I understand not having a good shell on top, as that part in particular varies quite a bit and people like different things, but something was just not right with the custard. Today's second demo was by Chef Mark Richardson, from Seasons Restaurant. He prepared not one, but two dishes! I haven't actually been to Season's yet, but it has been on my list for a while. 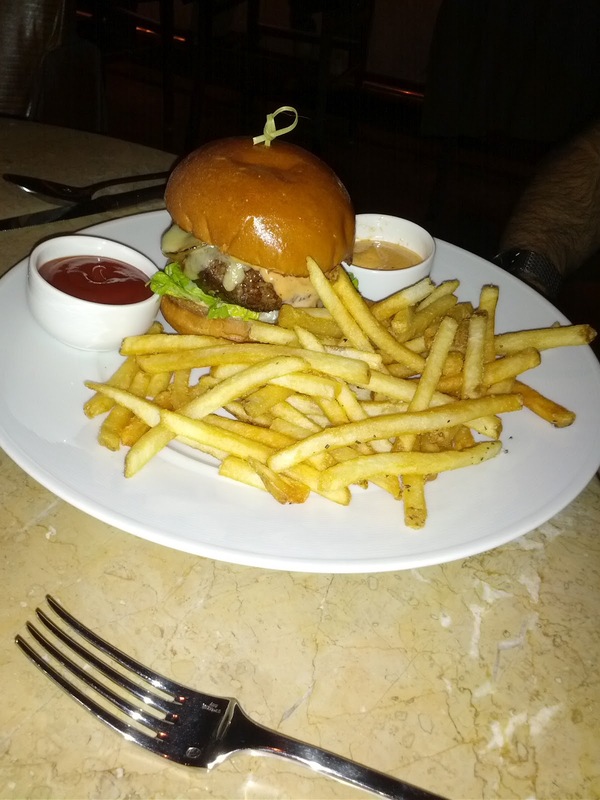 In particular, on Sunday and Monday nights, in the lounge, they have burger specials for $20. There are a bunch of different burgers, each paired with either a beer, wine, or cocktail. I don't even know how I'd pick one, as they all sound great. And then I have to pick cocktail or wine? Whee! Anyway, the soup he prepared was amazing. One of the best soups I've had in recent memory. Attending this demo definitely just raised Season's placement on my TODO list! 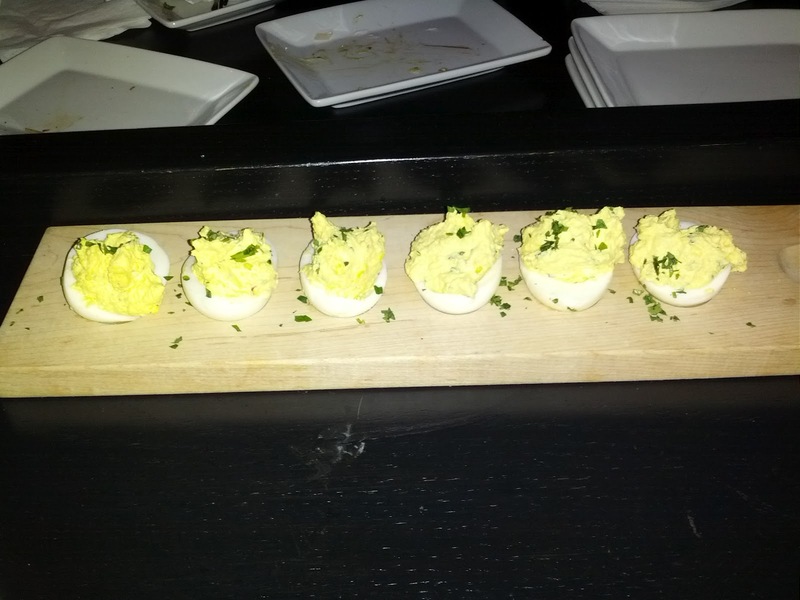 I've had a ton of deviled eggs lately. They are on basically every bar menu these days. And at the Taste of the Nation event last week, there were at least three very different deviled eggs - the famous Marlowe one (starts with classic mayo/mustard filling, but is served warm and topped with aged provolone, pickled jalapeño & bacon), and then Jasper's had a sweet pea and dungeness crab version (which was really, really good, surprisingly light too, which is not how you normally think of a deviled egg) and a romesco and marcona almond version. Anyway, these were just a standard mayonaise and mustard mix, with some chopped up habanero added in. The habanero added a little kick, but these weren't really anything special. Caramelized fennel soup with fava bean and orange relish. This, however, was special. Really flavorful, rich, and creamy. Perfectly seasoned, with a nice level of saltiness. I'm sure part of what made this insanely delicious is that it was about 90% oil + butter + milk + cream. But then it had the really nice refreshing citrus relish on top, which did lighten it up slightly. I've had plenty of raw fennel and citrus salads, so it makes sense that this pairing would work, and sure enough, it really did. The favas added another hint of freshness, and a little promise of spring. This was a really successful dish, and definitely makes me want to check out Seasons sometime. Today's first demo was by Chef Nicoali Lipscomb from the Fifth Floor. The Fifth Floor chefs are busy these days! I saw a demo by the executive chef David Bazirgan at Williams-Sonoma a few weeks ago and by Pastry Chef Francis Ang at the Ferry Building a few months ago. It was actually that demo that inspired me to organize a dinner at the Fifth Floor with some out of town visitors. They were also at the Taste of the Nation event two weeks ago, and Chef Baz was one of the guest chefs at the last Alexander's Steakhouse special foie gras dinners. Such busy folks! Today he prepared a pasta dish that is currently on their menu: Blue Bottle Cavatelli with lamb, ricotta, peas, and pea greens. Overall, I didn't like the dish all that much. 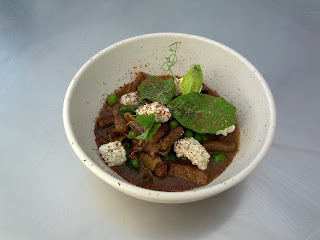 It felt like a hearty winter stew (the veal stock, the lamb) crossed with a fresh spring dish (peas, pea greens, ricotta), in a way that didn't do either justice. Perhaps given the beautiful weather and the slew of fresh peas I've been eating lately, I was just in a more springy mood! The demo was well done, and I learned a fair amount about pasta making, particularly, about how forgiving this sort of pasta is. I'm much less intimidated by the idea of making my own pasta now. Blue Bottle Cavatelli with lamb, ricotta, peas, and pea greens. This was a rich dish! He warned us several times that this would be a small starter, not something you'd want an entire plate of. Where does the richness come from? The lamb is marinated and then cooked in a mixture of veal stock and chicken stock. The sauce is later finished with quite a bit of butter. The flavors in the sauce were fairly complex and I enjoyed it, but it was definitely rich and very intensely meaty. The lamb was really tender, and I actually thought I was biting into one of the cavatelli rather than lamb at first! The ricotta paired well with the peas, but was again, pretty lost in the sauce. Today's Demo was by pastry chef Francis Ang, from the Fifth Floor. He made amazing beignets. Almond Beignet with Hamada Farms Satsuma marmalade, crème fraîche, candied sage. Fresh out of the fryer, rolled in cinnamon, sugar, and crushed almonds, with a dollop of creme fraiche, sitting on top of satsuma marmalade to dip it in ... so delicious! I can't wait to go to the Fifth Floor and have some of their desserts!